Research in reversible computation has drawn the attention of researchers over the years. 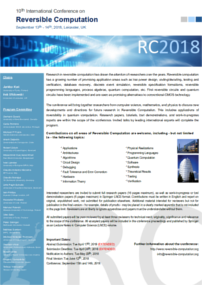 Reversible computation has a growing number of promising application areas such as low power design, coding/decoding, testing and verification, database recovery, discrete event simulation, reversible specification formalisms, reversible programming languages, process algebras, quantum computation, etc. First reversible circuits and quantum circuits have been implemented and are seen as promising alternatives to conventional CMOS technology. The conference will bring together researchers from computer science, mathematics, and physics to discuss new developments and directions for future research in Reversible Computation. This includes applications of reversibility in quantum computation. Research papers, tutorials, tool demonstrations, and work-in-progress reports are within the scope of the conference. Invited talks by leading international experts will complete the program. Interested researchers are invited to submit full research papers (16 pages maximum), as well as work-in-progress or tool demonstration papers (6 pages maximum) in Springer LNCS format. Contributions must be written in English and report on original, unpublished work, not submitted for publication elsewhere. Additional material intended for reviewers but not for publication in the final version - for example, details of proofs - may be placed in a clearly marked appendix that is not included in the page limit. Reviewers are at liberty to ignore appendices and papers must be understandable without them. All submitted papers will be peer-reviewed by at least three reviewers for technical merit, originality, significance and relevance to the scope of the conference. All accepted papers will be included in the conference proceedings and published by Springer as an Lecture Notes in Computer Science (LNCS) volume. At least an abstract of the work needs to be pre-submitted by the abstract submission deadline.